The Clubhouse is available to be booked by members, local families, individuals and organisations for a variety of different events from anniversary parties and wedding receptions to watercolour classes and most things in between. The premises are also available for regular lettings. Current classes include Yoga, Pilates, Philosophy and Baby Groups. 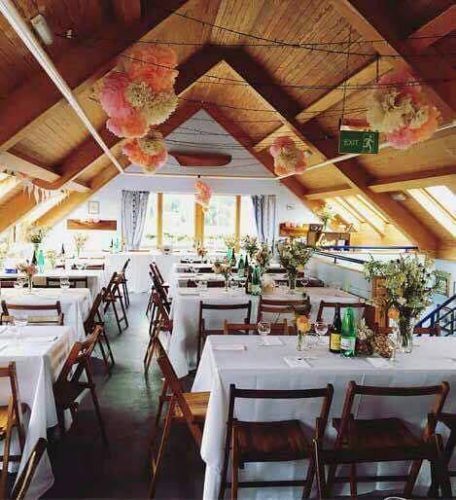 Wivenhoe Sailing Club is the perfect location for parties, meetings and classes. The upper deck provides a wide open space for functions with doors opening onto a balcony with splendid views of the River Colne. The image shows the Upper Deck dressed for a wedding. The lower deck is an L shaped room with a bar and a fully equipped kitchen with a serving hatch to the lower club room. There is easy access via stairs to the upper deck and large doors open onto a paved terrace area overlooking the river. Wivenhoe Sailing Club is an accessible building with a stair lift to the upstairs and an accessible toilet with baby changing facilities located in the foyer. There is also adequate parking for most functions and events. For more information, please email or use the Contact Form on this website.